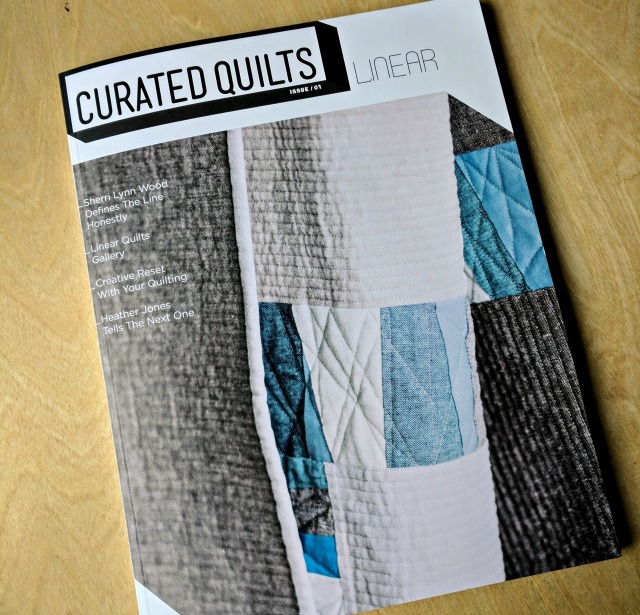 You've surely seen that the premier issue of Curated Quilts is out in the world. I'm still perusing my own copy and thoroughly enjoying it.... nicely done! 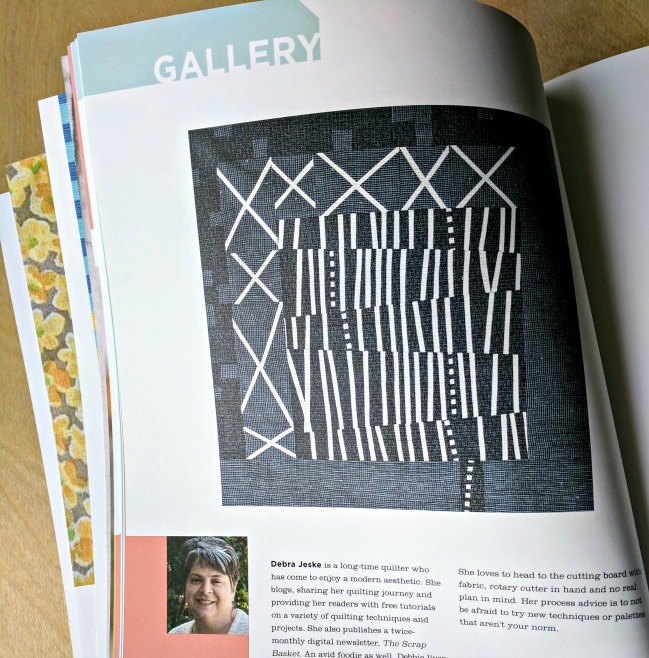 Two of my quilts are included in the Gallery - a showcase of sorts spread throughout the issue with quilts focusing on the theme - in the case of this first issue - "Linear". Of course I'll admit to showing the journal around a bit to a few family and friends, and an interesting thing happened. And I don't mean this negatively necessarily. It happens and I think we're all used to it and can handle it. But one person, when they saw my two quilts - Monochrome (above) and Yay or Nay (below) - instantly said of Monochrome, "oh this one's better." Now please don't feel like you have to stand up and defend me or either of my quilts. Please. That's not the point. I totally get that folks may like some of my work better that others. My work may not appeal to them at all. And that's ok! But what struck me about this comment was the fact that others can't usually know what lies within a finished quilt. I'm not talking batting and stitches, color or pattern. I'm talking the process.... the raw emotion that was felt in the creating. Sometimes it's the spirit of adventure, sometimes dabbling with a new technique. With Yay or Nay, it was deeper - being true to myself and not being afraid to do something wrong, to try something just to see what happened. It was a profound moment for me, and truth is, no matter what quilt you put up against it, Yay or Nay is likely to win out for me because of that experience alone. Of course, most folks won't see that and they definitely won't feel it. Again, if nothing else, it's a reminder to me - and hopefully to you - to let folks see what they see and be ok with that. But also to acknowledge that what we do and what we have is something pretty special. And to savor it. It's easy to get caught up in the stash, the new thing to try, the deadlines, the wips. In fact I'm in the midst of that sort of whirlwind right now. But what I want most is to drink in the process, to acknowledge the gift of creating that I've been given, to cherish the ways that my work reflects a bit of me that noone else may see. p.s. Both are wonderful quilts. Yay or Nay has always been one of my very favorites of yours! It is always interesting to hear what quilts of my creation speak the most to people. I actually like knowing that quilts that aren't my favorites are interesting to others. The direct comparison can be hard, though, and this is a lovely reminder and well written approach to embracing these kinds of comments. "There's nowt so queer as folk." Found out this week that my husband thinks I've made some ugly quilts. Like, he really hates some of them. He quickly assured me that some quilts of mine have been great. But still. Ouch. Congrats again on being published twice! Some people don't get art. I consider quilts art. And one persons' art is not the same as anothers. That's just life. Not everybody likes everybody, oh well. The mix is what makes it a heck of a ride. I sent a picture of two quilts I was working on, and she said that the green one wad better. I was floored! I felt like her liking the green one meant she didn't like the other, and I was upset. But she's really opinionated, so I've stopped showing her mid-process. Congrats, Debbie....your quilts look great! I have been enjoying my copy of the magazine as well. Great post.....lots to think about. When I look at my quilts....I almost see them as snapshots of various times in my life. I like the thought that one can pour their emotions into a work of art. Very cathartic.....I know the story behind each quilt and I don’t worry too much what others see or don’t see, for that matter. That is such a great insight, Debbie. Such a good thing for me to keep in mind. Be brave, don't worry about "wasting" time on something that doesn't work out because it may get you to something amazing - just look at how it turned out for you! I have a hard time with that concept, so thank you. As a quilter I have learned to look deeper into other peoples quilts, visually and through their process or story. We put a lot of ourself into our quilts in various ways that others cannot imagine or see. All that becomes woven thoughout our quilts much like the fibers of the fabric. It is interesting to see how people react to different quilts. Yours tell a story and we all feel your passion and commitment to each one! Yes! So true! Although I haven't been quilting for very long, I've come to cherish the quilt process and the emotions I feel while designing and creating them. Rather than rushing through a project, I'm trying to appreciate each step of the journey and tune in to the dialogue I have with myself, with my work along the way! Congratulations on your two beautiful quilts being featured in Curated Quilts!! There are not enough words to convey how much I enjoy each and every quilting journey you take all of your blog readers on. I love them all even though some would be way outside my comfort zone. To not be afraid to try something new and out of the norm is excellent advice. Thank you for sharing! I remember many years ago having some of my paintings on display at a local gallery. I stopped and stood back just enough to hear people as they walked past my work and gave their opinions to they partners. It was quite eye opening. Beauty, Art, Music all things creative have a different meaning to those who view or listen to them . . . and for some reason everyone (whether knowledgeable in the field or not) has an opinion. I learned early that if you are going to put your work out there for the world to see, you can't wear your heart on your sleeve. The world is full of idiots with big mouths. I admire you for stepping outside your comfort zone . . . sometimes you find that it is a wonderful adventure, one that you would not have wanted to miss. I love visiting your blog and seeing your amazing work. I aspire to someday having half your talent. You make a very good point and one that I think most all artists could relate to. Often only the artist knows what went into creating a piece. The whys. The reasons. The emotions. That's exactly why art is subjective and artists need to believe in themselves and create from within. I know people that look at quilts and say things like " she could have done that better" thats a no go for me. If a quilt is good for the quilter who made it it is always good to me too! We all have different standards and if the creator likes his work nobody should judge him. I like all of your work! It's very interesting to ask quilters themselves to choose their favorite quilt and ask them about why it is a stand out. 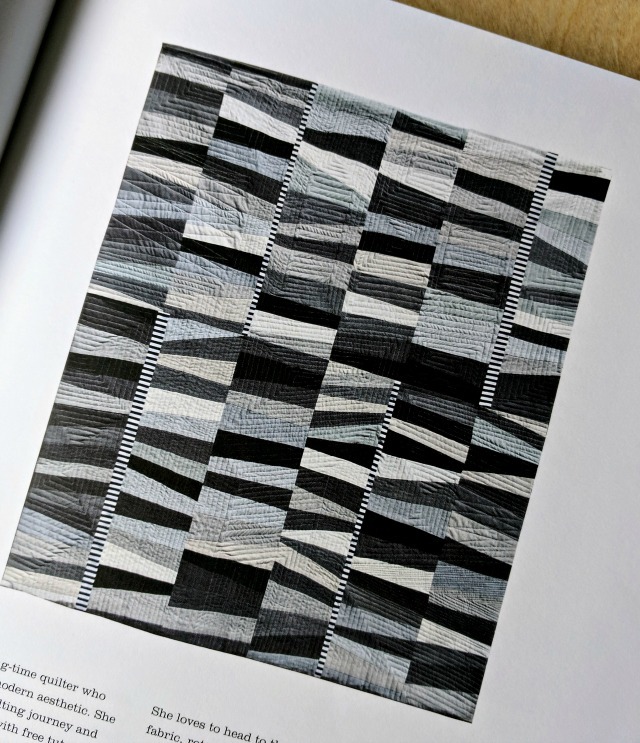 I find it is often something about the experience of making the quilt or some memory associated with the fabrics that holds the most meaning for them. That is, as you say, something now one else will see about the quilt and why things like trunk shows and show and tell are irreplaceable for real quilt enthusiasts. You have such a positive prospective. Thanks so much for sharing it. I agree that only the creator can know what goes into anything she created. Therefore only the creator can make a judgement call at any level. One of the many reasons I love your blog -- you always enlarge the way I look at things. You are so right Debbie: Right now I am very caught up in organizing and making quilts for a charity which is very dear to my heart. I don't belittle this work but it is very hard to find time to experience and grow in my quilting in the way you are expressing here. It's important to squeeze some of that creativity in there somewhere though or I'll burn out. No need to write back to this comment, as I've put a few into your mailbox today, but I loved reading this post and the comments. Comparison robs joy, is a saying my daughter has on her fridge. I try to remember that.